In general this portal tries to review books, that excel in their clear and unique view on an economical or political problem. The selection is strict. Also Politische Ökonomie des Sozialstaats by the sociologist Heiner Ganßmann satisfies the criteria, although some weaknesses can be identified. The subject, the welfare state, or in the German language the Sozialstaat, is discussed since decades. Ganßmann explains in an admirable manner the ideological and political framework, that is used to arrange the welfare state. It is a pleasure to review his book. 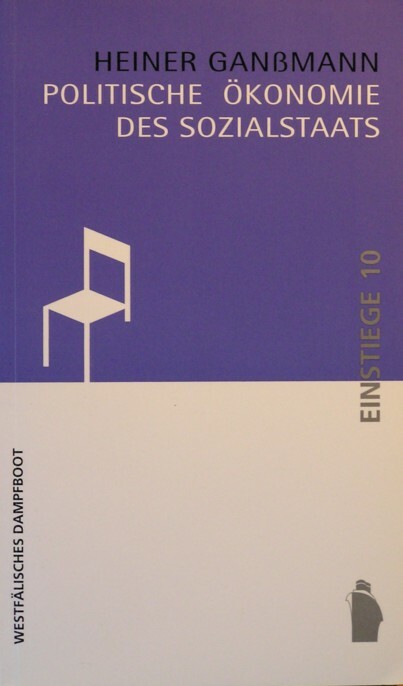 Verlag Westfälisches Dampfboot is a publisher off the beaten track, who among others has issued the works of Elmar Altvater. But the contents of Politische Ökonomie des Sozialstaats is not really radical. On the contrary, Ganßmann presents a scientific argument, in order to clarify the need and motivation for the welfare state. He does not conceal his personal opinion, but there is nothing wrong with that. The position of the factor labour is the leading thread that runs through all chapters. Only the seventh chapter deviates somewhat, since it discusses the various pension schemes. The cause is perhaps the age of Ganßmann, namely 69 beautiful years. Ganßmann states that since ages Germany lowers its taxes, while at the same time the national debt is reduced. Of course that leads to less state. None of the major political movements oppose this liberal policy. Yet there are disadvantages. For instance in this way the state has less room for investing in the distant future. The welfare state, which was completed in the golden era 1950-1975, is cut down. There is sufficient wealth for its maintenance, but the social willingness has caved in. The welfare state is indispensable, because the free capitalism of the nineteenth century is socially unbearable. However, he can take on many shapes. Ganßmann considers three of them, which originate from the liberalism (the Anglosaxon model), from the conservatism (the traditional model), and the social-democracy (the Scandinavian model). The choice for a certain model depends on the power distribution between the democracy (politics), the plutocracy (rich private groups), and the autocracy (the administration). The power bases of the three competing systems are respectively the people, the capital and the state. In reality the country is evidently always ruled by a mixture of the three systems. At the global level Ganßmann perceives a movement towards the logic of the plutocracy. This makes him worry, because humans are more than a homo economicus. Free markets do not do justice to all human needs. For instance the welfare state contributes to a reduction of the existential risks for the people. Often market mechanisms lead to a suboptimal result, because they can not be reconciled with deliberations or cooperation. Now it is not obligatory that the social security is supplied by the state. There are alternatives, and those explain the multiplicity of the various national systems. Security can be supplied by private associations or by the state. She requires only a stable structure, which gives the people confidence in the system. The individual must decide about the redistribution of his income during his total life span. Ganßmann prefers state provisions, because the state possesses the power to command the redistribution. The state is always able to levy taxes, and in this way cover the expenses. Here the book discusses some technical problems, such as externalization and the principal-agent problem. The democracy determines the desired level of social security. According to the underlying principle human and civil rights are only guaranteed, as long as also the social rights are warranted1. Moreover the state corrects the distribution deficiencies of the "free" market. A durable economic growth is not ensured in advance, because the factor labour can not force the factor capital to invest (necessary for growth)2. The factor labour does have the power to demand a higher wage level, if the investments fail to appear. Ganßmann calls this social tug-of-war the K-game. The institutional frame determines the rules of the game. That frame is itself the subject of a political struggle. The economically inactive persons are the non-players of the K-game. They obtain their income through the welfare state. The enterprises want to economize on their wage costs, and therefore appreciate some unemployment. Here Ganßmann refers to the ideas of the famous economist M. Kalecki. The unemployment benefit mitigates the commodity character of the factor labour. It is solidarity within a class, and a coverage of risk. Besides, the state can stimulate the economy in a Keynesian manner, and thus the employment as well. For several decades the economists even dreamed about a fine-tuning of the future business cycles. According to Ganßmann the Keynesian policy failed as a result of the globalization. It is no longer possible to coordinate the economy. In technical terminology: the demand-side management is replaced by a supply-side management. Nowadays a rising unemployment makes the welfare state unpayable. Due to the globalization the entrepreneurs become increasingly unwilling to invest, at least in Europe. Capital becomes scarce again. In this way the unemployment has risen considerably in Germany and in France. Next the social security has been cut down. The welfare state is presented more as a problem than as an asset. He is called inflexible. Ganßmann argues that flexibility is also expensive. But the costs are shifted to other groups, notably the workers!3 The rigidity allows the workers to adapt to the changes! This makes the employment more durable. Especially the Scandinavian model succeeds in combining flexibility and security. It employs an active labour market policy. On the other hand Ganßmann calls in question the liberal solution, namely the expansion of cheap labour. That simply diminishes the wage level. He advocates a European coordination of demand-side management. After all these intriguing and sharpwitted arguments the final chapters of the book disappoint a bit. It has already been mentioned that here Ganßmann discusses the pension plans. The pensions must be paid by a per capita contribution of the workers, or by a capital coverage. An advantage of the capital coverage is that thus also foreign states (that is to say, their workforce) can contribute to the dividends, that pay for the domestic pensions. Ganßmann objects that foreign money transfers are always risky and speculative. Therefore he advocates the per capita contributions, just like your reviewer4. However, his arguments are not completely convincing, so that some restraint is justified. The final chapter about the globalization and the European market discusses the direction of the financial and monetary policy. At the supra-national level a new model of social security must be chosen. Here Ganßmann presents an interesting analysis, but his explanation is difficult to follow. If your reviewer understands him correctly, then he applies the so-called monetary trilemma, the monetary policy triangle. His explanation deviates in a curious way from the usual approach5. The essence is again the rejection of liberal solutions. Since the social security is and remains the task of the nation states, the European Union does not need to prove her "reciprocity" towards the people. At the European level there is no longer a social convergence, because the national political and cultural obstacles are too large. That also impedes that the successful Scandinavian model is adopted by all member states. Given this situation Ganßmann is more in favour of a European Bretton Woods system (with a regulated capital flow) than of a European federation. The international notion must grow that the welfare state has its advantages. Often the economic (transaction) costs can be reduced, if competition is replaced by cooperation. That is a beautiful final remark. It is essential to cut and contrive.